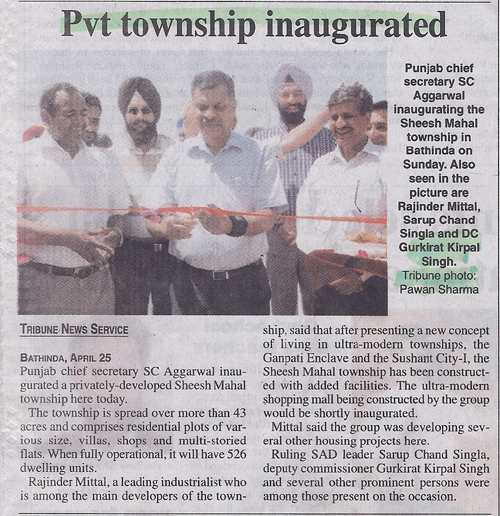 Punjab chief secretary SC Aggarwal inaugurated a privately-developed Sheesh Mahal township here today. The township is spread over more than 43 acres and comprises residential plots of various size, villas, shops and multi-storied flats. when fully operational, it will have 526 dwelling units. Rajinder Mittal, a leading industrialist who is among the main developers of the township, said that after presenting a new concept of living in ultra-modern townships, the Ganpati Enclave and the Sushant City-I, the Sheesh Mahal township has been constructed with added facilities. The ultra-modern shopping mall being constructed by the group would be shortly inaugurated. Mittal said the group was developing several other housing projects here. Ruling SAD leader Sarup Chand Singla, deputy commissioner Gurkirat Kirpal Singh and several other prominent persons were among those present on the occasion.